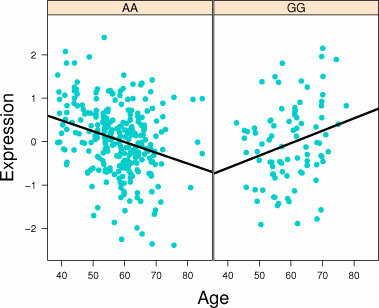 Genetics and age combine in their effect on gene expression: for people with the AA genotype, ageing and environmental stress reduce the activity of the gene, those with the GG genotype see the gene become more active with age. “Ageing wasn’t this difficult when I worked on worms.” This comment by a first author on our recent Genome Biology paper is a recognisable lament to many of us who work in genetics. Ageing is a simpler problem when it comes to worms. You watch their birth; you watch their death; you can tell which of them are further along the path than others. There are many model organisms where we understand ageing pretty well. We know how to alter a fly’s DNA to make it live longer, we know how to feed a mouse to do the same. But until my C. elegans anti-ageing cream takes off among the worm population, what we really need to do is learn how this knowledge applies to humans. The Genome Biology paper discusses the relationship between ageing and gene expression, the very first stage at which the genetic code is read within the cell. As we’ve seen in our research, changes to gene expression in our cells can be a starting point for disease that affects the whole body. The most basic example of this is expression quantitative trait loci, where, for example, we change the genetic code in a specific location, a single gene becomes more active and downstream we see an increased risk of cancer. A simple story of nature in action. The paper tackles many aspects of ageing and gene expression, including how cellular processes change with age and the connection between cancer and ageing. But I want to focus on a different aspect of the paper: the change in the role of genetics as organisms age. It is here that we see, for the first time, evidence in humans that directly mirrors our experience with model organisms. One aspect of genetics in model organisms that hasn’t translated over to humans is that the genetic effects we observe in animals are often highly specific to a particular environment. The old dichotomy of nature and nurture doesn’t hold: nature requires a particular nurture to show its effect. In human genetics, partly because it’s hard to measure nurture and possibly because we’re different and special, we haven’t seen genetic effects that change much because of environment. Nurture has been effectively ignored when we’re looking at nature, but this paper specifically tests the assumed split between genes and environment. Because ageing can be seen as the cumulative sum of everything we have been exposed to over the course of our lives, we can ask the simple question: does this cumulative sum change the way genes are expressed? Of the 3,529 genes where genetics has a known effect, we found that for 610 the evidence suggested that the effect changed as we aged and as our environments changed. Expression quantitative trait loci have been much studied because they promise to build the entire story of the role of genetics in disease from the ground floor up. With this paper we begin to see that at the ground floor, nature and nurture are already intertwining. The direct effect of these expression quantitative trait loci depends on context; the stresses the person has experienced. This was obvious for model organisms because within laboratories the environments and stresses can be quantified and controlled easily. Discovering this outside the lab will be difficult, but with this study we begin to see that we are not so different from the animals we have studied and that our genetics is not necessarily our destiny. Andrew Brown is a Postdoctoral Fellow in the Genome Informatics group at the Wellcome Trust Sanger Institute where he works on the EuroBATS project.